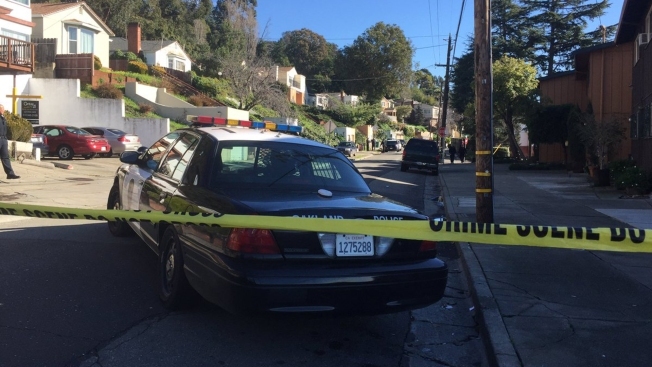 A 22-month-old girl and her mother were seated in a car in Oakland on Thursday when gunshots rang out, injuring the child, according to police. The pair were in a vehicle near 65th and Outlook avenues when someone started shooting around 12 p.m. Police said a bullet struck the child, who was taken to Highland Hospital and then transferred to UCSF Benioff Children's Hospital for treatment. She is in stable condition, police said. Department spokeswoman Officer Johnna Watson said police do not know if the car was moving or parked during the shooting or even if anyone else was in the car at the time. A preliminary investigation led officers to the 6600 block of Outlook Avenue. Police are now canvassing the East Oakland neighborhood, which is primarily residential, to see if anyone saw or heard anything or has surveillance footage that might lead officers to the person who shot the toddler, Watson said. An investigation is ongoing. "We want to find out who’s responsible. We want to locate them. We certainly want to remove them from our streets," Watson said. Neighbor Clare Stanley told NBC Bay Area that she heard roughly four "loud" gunshots, then a "pause," and then several more shots. She also heard a "car speed away," but did not see the victim or any potential suspects. Watson said investigators are looking into the possibility that the shooting was somehow connected to a homicide a day ago on the other side of the city — Oakland's first homicide of 2017. Davonte Thomas, the father of an 8-month-old boy, was fatally shot in the 900 block of 16th Street in West Oakland around 1:15 p.m. Wednesday. Gregory Nash, 21-year-old Thomas's father-in-law, said that he's hurting not only for his own family, but also the child who was wounded Thursday. "This is crazy," he said. "What's in the minds of people doing this?" However, speaking from her bedside, the wounded toddler's family insisted Thursday that the two cases are not related. People with information are asked to call the Oakland Police Department’s Felony Assault Section at 510-238-3426.